Way back in early 2000, the Kelkar committee report stated "There is an urgent need to review the whole concept of indigenisation and self-reliance and it is time to go beyond the idea of looking at indigenisation purely as import substitution of components, sub-assemblies, etc. within the country from raw materials. Today indigenisation as a concept will need to involve capability enhancement and development, increasing know-how, design and system integration, rather than having numerical targets". The opening sentence of Defence Production Policy “Self-reliance in Defence is of vital importance for both strategic and economic reasons and has therefore been an important guiding principle for the Government since independence. Such often repeated statements had no tangible effect and self-reliance remains wishful thinking as most weapons and equipment continue to be imported. The SIPRI's annual report released in early 2018, 'Trends in International Arms Transfers,' makes an assessment for a five-year block (2013-17) and brings out that “India was the largest importer of major arms and accounted for 12 per cent of the global import. The top five arms importers were India, Saudi Arabia, Egypt, the United Arab Emirates and China, which together accounted for 35 per cent of total arms imports. India remained the world's biggest arms importer over the past five years, and increased its share of global arms imports from 9.7% in 2007- 12 to 12.8% in 2012- 16. 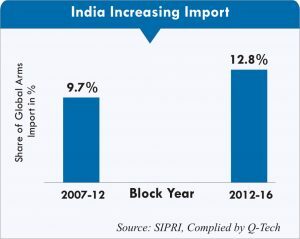 In comparison to previous 2008-12 block India's imports increased by 24 per cent. A large capability gap exists in the technology and equipment held by defence forces produced indigenously Vis-a vis what is needed. Most of our weapons are either outdated or need to be augmented with affordable contemporary systems. The domestic industry both in terms of global standards of technology and performance has been unable to meet the military needs. Consequently, even today the armed forces are saddled with 50% obsolete equipment with considerable delays in indigenous projects resulting in huge cost overruns and importing almost 70% of its equipment. Indian defence forces desperately need to acquire technology to achieve any semblance of the desired self reliance. The production agencies in the past never bothered to acquire knowledge including the “know-why” and “know-how” of developing a certain class of equipment and have not been able to absorb the technology, and been happy with a role to mere assembler. “Make in India” programme in defense production story is a dichotomy. It has leap frogged in some areas, but it is struggling with basics in many others. A significant progress in some sectors such as Missiles but a clear neglect in others such as Rifle, the basic weapon has no explanation. The plausible reason being probably nobody considered them attractive enough. For example take the case of 155 mm Gun from Bofors. The country has paid for the technology transfer both for Weapon and its Ammunition in 1987. All technical documents related to Weapon were gathering dust for so long. How come Ordnance Factory Board made the Ammunition and not the weapon? Almost after 3 decades OFB had a look at the paper particulars to produce Dhanush. The other example of neglect being nuclear submarine vs conventional submarine, aircraft carrier vs minesweeper the later are less complex to make. The DRDO programs have come up with little to no result besides cost and time over run, thus doubling the mode of development. The Integrated Guided Missile Development Programme (IGMDP) under DRDO developed missile systems Agni, Prithvi, Akash besides the Pinaka rocket launcher, Advanced Towed Artillery Gun System (ATAGS) etc. The LCA Tejas fighter jet with GE404 Engine, ejection seat, beyond visual range (BVR) missile and the multi-mode radar has 40 per cent imported content. The ALH, and AEWC have import contents of over 40%.MBT Arjun, with fire control system, MTU 838 engine, gearbox etc has 55 per cent imported elements. The list includes its anti-tank Nag missile, which has 30 per cent imported content, Agni series of missiles has 15 per cent imported content, and so is the case with Prithvi missile. Technology acquired, so far has stagnated at the rudimentary level and not matured as envisaged to leapfrog technological generations. These include Indo-Russian BrahMos, Indo-Israeli Long Range Surface to Air Missile (LR-SAM), and the Arihant-class nuclear submarine to name a few. The imported content in BrahMos supersonic cruise missile is 65 per cent and is not even expected to come down as these are cutting-edge technologies. In case of the Long Range Surface-to-Air Missile, Israel Aerospace Industries, which is partner in the project, provides for 60 per cent of the content. Under this category most of these were an off-the-shelf purchase followed by building the equipment in India with transferred technology with Govt manufacturing sector e.g . myriad of combat aircraft, such as the Sukhoi-30MKI, Mirage 2000 and numerous MiG-series fighters besides Tank T-72, Tank T-90, and BMP. Most of the Power Packs in all major platforms are imported. Technology acquired mainly under (b) and (c) above, has so far stagnated at the rudimentary level and not matured as envisaged to leapfrog technological generations, as a result failed to do even midlife upgrade. For example: after every foreign acquisition such as the MiG-21, T-72, Bofors gun, T-90, and others, DPSUs have failed to master the acquired technologies and improve upon them, necessitating further ToTs with each purchase. The stumbling block in indignation is the non-sharing original design details and drawings of Russian equipment such as T- 72, T-90 tanks and BMP. There are contracts clauses governing maintenance of secrecy concerning Russian ToT (Transfer of Technology) sharing original details and drawings, curbs on exporting the documents. Indian production agencies have only option to reverse engineer the drawings for manufacture of parts. Recently Russia has shown interest in working with the private sector, including the small and medium industries. The above statics summarizes the hollowness of ‘Make in India' slogan on the same line as achieving 70% Self reliance. The recent draft defence production policy talks about self-reliance in key technologies by 2025 and sets a target of Rs 1,70,000 crore turnover in defence goods and services involving additional investment of nearly Rs 70,000 crore. It looks at achieving exports of Rs 35,000 crore by 2025, putting India among the top five countries in aerospace and defence industry. It is time to be realistic rather than making tall projections and take bold decisions. The defense modernisation, must lead to a transformative change in defence industrial base or else we will remain dependent on imports for major platforms. Synergizing public and private sector is a must for creating robust indigenous defence industrial capabilities. The industry is a stakeholder in defence production. Government should chalk out a strategy in consultation with Industry organisations to promote indigenous design, development and manufacture. Gradual and systemic reduction of import dependence must be achieved by involving all stakeholders of our country. Technology transfer needs to be carried out in the true spirit where both the supplier and the recipient are competent organizations. The local industry should be able to absorb and further develop the technology thereby leapfrogging existing technology lag. Defence trade must look beyond the buyer-seller relationship to co-production and, eventually, high-technology joint research and development so that technology is ultimately transferred to India. Though, India may be a late starter, but with own domestic market advantage we should be able to get the updated and most modern technologies with midlife upgrade capability, particularly as these systems would be used for a number of years. Indian industry will benefit if adequate policy measures are taken for instance by offering incentives and strengthening overall supply chain from component manufacturers to system integrators.